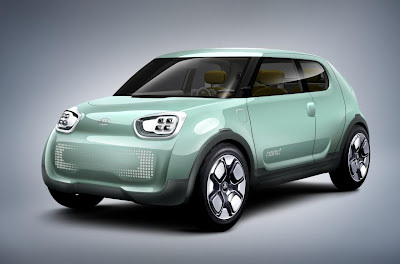 Korean brand Kia has unveiled the new Naimo electric car concept at the 2011 Seoul Motor Show today. The Naimo's name is derived from the Korean word 'Ne-mo' which means 'square shape'. 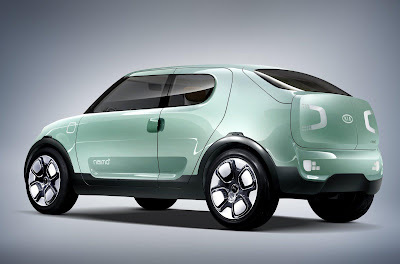 And this is one concept which isn't running away from its boxy design. It features no B-pillar and rear-hinged doors. But the design of the Naimo is influenced by Asian Celadon-style pottery, with its asymmetrical shapes reflected in the roof design of this concept as well as in the dot-styled LED headlamps which also provide an off-center feel to the car. Those off-kilter design cues are meant to contrast with the square shape of the car. On the inside, things get a little more down to earth with the use of Korean oak for the floor and interior door panels. Korean "Han-ji" paper serves as the headlining and these hand-crafted interior touches are complimented by the off lines of that sunroof design. Powering the Naimo is a PMSM (Permanent Magnet Synchronous Motor) electric motor with an output of 80 kW (109 PS / 109 bhp) and 280 Nm (206 lb-ft) of torque. Juice is supplied by a 27 kWh lithium-ion battery pack positioned under the rear trunk. The car rolls on low-resistance tires on 20-inch alloy wheels. Top speed on the Naimo is 150 km/h (93 mph) and the car has a range of around 200 km (124 miles) on a single charge. A quick-charge system (50 kW) allows the battery to reach 80 percent capacity in about 25 minutes.